GAITHERSBURG, Md., October 6, 2011 - Sodexo, the world leader in Quality of Daily Life Solutions, is making a play to sack concession waste at Ohio Stadium with its partner The Ohio State University. After  three games this season efforts have diverted nearly 60,000 pounds of waste – the equivalent weight of about 300 college football players – away from landfill. 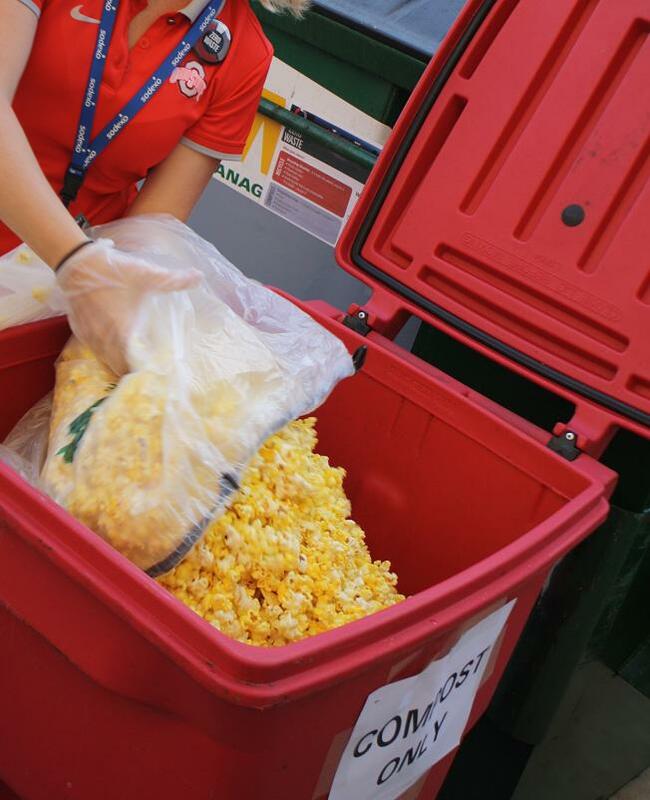 Zero Waste’s goal is to divert 90 percent of Ohio Stadium’s gameday waste away from landfill. Ohio State and Sodexo diverted 70 percent of waste away from landfills after only three games this season. According to detailed Ohio State evaluation reports, the game against Akron resulted in a 76 percent diversion rate, a total of 17.2 tons collected with 13.9 tons diverted with 4.1 tons going to landfill. The game against Toledo resulted in a 63 percent diversion rate, resulting in 13.2 tons collected with 8.8 tons diverted and 4.8 tons going to landfill. The Colorado game resulted in a 72 percent diversion rate with 11.7 collected and 9.4 diverted and 3.6 tons going to the landfill. The Ohio State office of Energy Services and Sustainability and the Ohio State Department of Athletics Facilities office designated two waste streams for this football season – compost and recycling. Stations have been set up near concessions stands to encourage fans to recycle and compost. The message is simple: If it looks like food or paper, then compost it. If it looks like plastic, metal, or glass, then recycle it. Trash stations have been removed from the stadium. Sodexo trained more than 600 employees and volunteers over the summer to prepare for the Zero Waste program and the company reinforces the effort with refresher training before each game to send the least amount of waste to landfill. Fans will not bear the cost of implementing Zero Waste. Ohio State Energy Services and Sustainability received a grant from the President’s and Provost’s Council on Sustainability to help subsidize the Zero Waste implementation and Sodexo has also provided financial assistance by absorbing the cost of providing more compostable and recyclable products in the stadium. Sodexo, Inc. (www.sodexoUSA.com), leading Quality of Daily Life Solutions company in the U.S., Canada, and Mexico, delivers On Site Service Solutions in Corporate, Education, Health Care, Government, and Remote Site segments, as well as Motivation Solutions such as Esteem Pass. Sodexo, Inc., headquartered in Gaithersburg, Md., funds all administrative costs for the Sodexo Foundation (www.SodexoFoundation.org), an independent charitable organization that, since its founding in 1999, has made more than $13 million in grants to fight hunger in America. Visit the corporate blog at www.sodexoUSA.com/blog. Quality of Life plays an important role in the progress of individuals and the performance of organizations. Based on this conviction, Sodexo is the strategic partner for companies and institutions that place a premium on performance and well-being, as it has since Pierre Bellon founded the company in 1966. Sharing the same passion for service, Sodexo’s 380,000 employees, in 80 countries design, manage and deliver an unrivaled range of On-site Service Solutions and Motivation Solutions. Sodexo has created a new form of service business that contributes to the economic, social and environmental development of the communities, regions and countries in which it operates and to the fulfillment of its employees.